One click to download any Vimeo video no matter it's enabled for downloading or not. Convert Vimeo to WMV, MOV, MP4, AVI, FLV, MP3, WMA, MPG, MKV, 3GP, WebM, SWF, and so on. Batch download Vimeo videos to save you big time. Create optimized video for iPad, iPhone, iPod, PSP, etc. 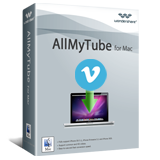 Download Vimeo video to edit with your favorite software like Windows Movie Maker, iMovie, Final Cut Pro, iDVD, etc. Download videos from 100+ sites in addition to Vimeo. One click to download all videos in YouTube playlists, channels, use pages and categories. Play downloaded and existing videos with the supplied media player. Convert existing FLV/MP4/WebM video to nearly any format. Free to try, only $29.00 to buy. Why Choose Wondershare Vimeo Downloader? Wondershare Vimeo Downloader. is one of the best online video downloader. It can not only support downloading video from Vimeo in one click, but also download and convert videos from 100+ sites like YouTube, Metacafe, Dailymotion, Facebook, Google Video, Yahoo Video, adult sites and among many. Various ways are available to save videos from Vimeo: The classic "Copy and Paste URL" way, the "Integrated Download Button" and Drag and Drop URL methods. The integrated Download button way is highly recommended, which lets you directly download Vimeo video to your computer without leaving your web browsers (IE - PC only, Chrome, Firefox and Safari - Mac only). Wondershare Vimeo Downloader not only downloads Vimeo videos, but also converts the downloaded video to edit with your favorite video editing software like Windows Movie Maker, iMovie, Sony Vegas, etc. High quality videos are guaranteed. You may already realize that some Vimeo videos are downloadable without any Vimeo downloader. This is under control of the video owner. If the owner lets you download his video, you'll see a download button under the video. With the help of Wondershare Vimeo Downloader., you can download any Vimeo video no matter it's shared or not. After downloading the Vimeo video, you can use the built-in conversion tool to convert Vimeo video to virtually any format you desired. All popular portable devices are also supported, which means the converted can be watched on your selected device without worrying about the video format. To your convenience, you can even enable the Download then Convert option, so you can directly save Vimeo video to the previous selected format. This is really the one-click solution for Vimeo downloading and converting. Depending on your settings, you're able to download up to 8 Vimeo videos simultaneously. Why not download more videos? This is related to your bandwidth. The more Vimeo videos are being downloaded, the more bandwidth is required. 8 videos are usually enough. We know your favorite web browser might not be Internet Explorer or Safari. Don't worry. You can use Chrome or Firefox as well. Also, if it doesn't work on one web browser, you can switch to another to do troubleshooting. The built-in media player can play the downloaded and existing videos. Just download Vimeo video and play it immediately. Or import your previously downloaded video to the library for playing or converting. For the downloaded Vimeo video, you can always visit the original video on Vimeo to post a comment or locate the converted video files conveniently. Below are the main primary windows of Wondershare Vimeo Downloader. Both Windows and Mac version have intuitive and sleek interface. The free trial version of Wondershare Vimeo downloader allows you to download YouTube for free and download Vimeo video for 10 times.